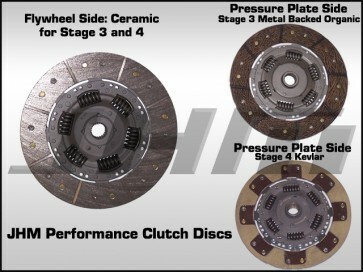 NOTE: This clutch disc will fit any pressure plate and flywheel setup that has a 240mm disc. This disc will fit ANY JHM Clutch and/or Flywheel Combo featuring the B7-RS4 Pressure Plate OR the JHM "R Series" pressure plate. SPECIFICATIONS - These JHM Stage 3 (hybrid Ceramic/Metal Backed Organic) discs are from a result of actual on car testing (video proof above) and from pressure plate clamp load testing that JHM had performed on all the available pressure plates for the B6-B7 S4 and RS4. Most of the on car testing was to find the optimal materials for the most streetability while delivering the performance any Naturally Aspirated B6-B7 S4 could dish out. The hybrid combination of materials has made the clutch hold better and handle higher heat as well while still being smooth enough for every day driving with a stock like pedal feel. The risk with reusing a used non-resurfaced flywheel with a new clutch. 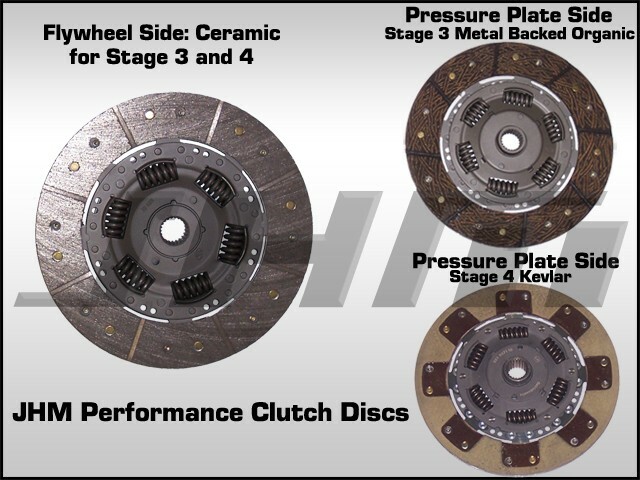 In our experience with many different clutches we have tested and installed over the years we have found that when you don't replace or resurface your flywheel the new clutch disc friction material may not bed in correctly, thus causing a chatter when starting from stops. This is not always the case but can happen, JHM just wants their customers to be aware of this risk. If you are concerned about this check out our 2 different flywheel and clutch combos we sell in this section. NOTE: Clutch break-in is important and must be done properly. For the Stage 3 clutches you need to drive as much city type driving as you can for the first 500 miles (each time you start from a stop or shift it aids in break in, highway mileage does not count). For Stage 4 clutches the procedure is the same but you must do this break in procedure for 750 miles. Due to Kevlar's resistance to wear it takes longer to break in. You also MUST avoid any racing activities, launching, or aggressive driving that gets the clutch too hot during this period.